One of the commoner species of tellin bivalves, the Cream Wafer Tellin lives deeply burrowed in shallow subtidal sandy habitats. 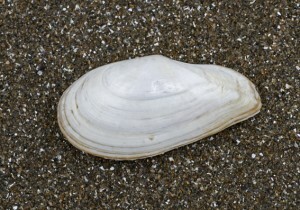 Shells grow to approximately 85mm, though most specimens are much smaller. Mostly seen only as dead valves drilled by sand snails, tellin species are delicate and the family shows a wide variety of colours and patterns. This species, as the common name suggests, is generally a cream shade. However, others can range from pink to orange [e.g. Small Hawk Tellin, T. (P.) pharaonis] or have attractive radiating colour bands [e.g. Striped Tellin, T. virgata].